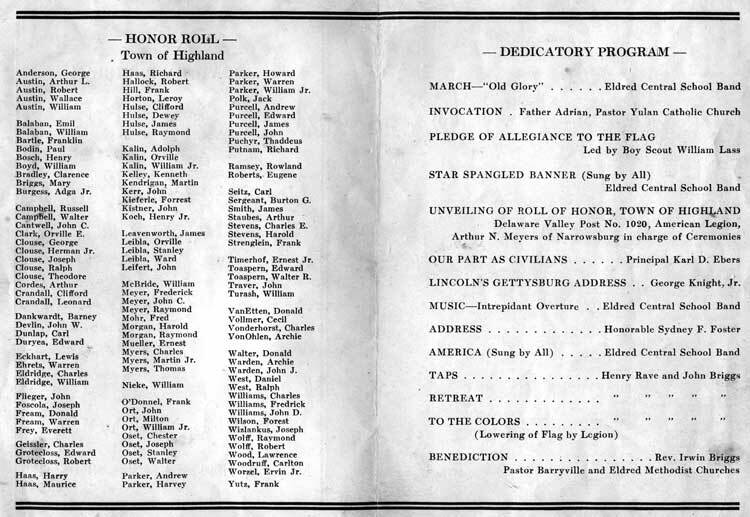 May 5, 1944 Honor Roll Program, courtesy of Mary A.
I have recently pulled together the diaries and letters from 1942 to 1945, to form the skeleton of the text for the years of WWII. The following is a list of the Service men and women that I gleaned from 4 sources, including the Honor Roll Program shown above. If anyone has name corrections or additions, please leave them either in the comment section or email me: info (at) halfwaybrook (dot) com. Note: Those listed with the same last name are not necessarily related. Also if someone listed is your relative and you know the branch they served in, the country they were in, and the years they were in service, it’d be great to have that info, too. Thank you so much! Kalin, Adolph, Orville, William Jr.
Ort, John, Milton, William Jr. Warden, Archie, Ian, John Jr. This entry was posted in Info/photo request. Bookmark the permalink. Thank you for listing my Uncle Cliff Sulzbach. His name was actually Christopher, his nickname being Cliff.